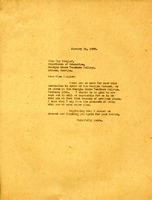 The letter is an invitation from the Georgia Day Committee of the Georgia State Teachers College to attend a banquet being given on February 12, 1929 at 7:00pm. There is also a request for Miss Berry to make a speech at the banquet. 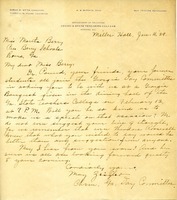 Martha Berry writes May Ziegler of the Department of Education to thank her for extending an invitation to speak at the Georgia Banquet, to be given at the Georgia State Teachers College on February 12th. However, Miss Berry informs her that she cannot attend due to a prior engagement but hopes that she will be able see Miss Ziegler some time in the future.